It is Hatch Green Chili time! Hatch Chili’s are native to New Mexico dangling from from hundreds of plants mainly located in the quaint, farming village of Hatch, NM. 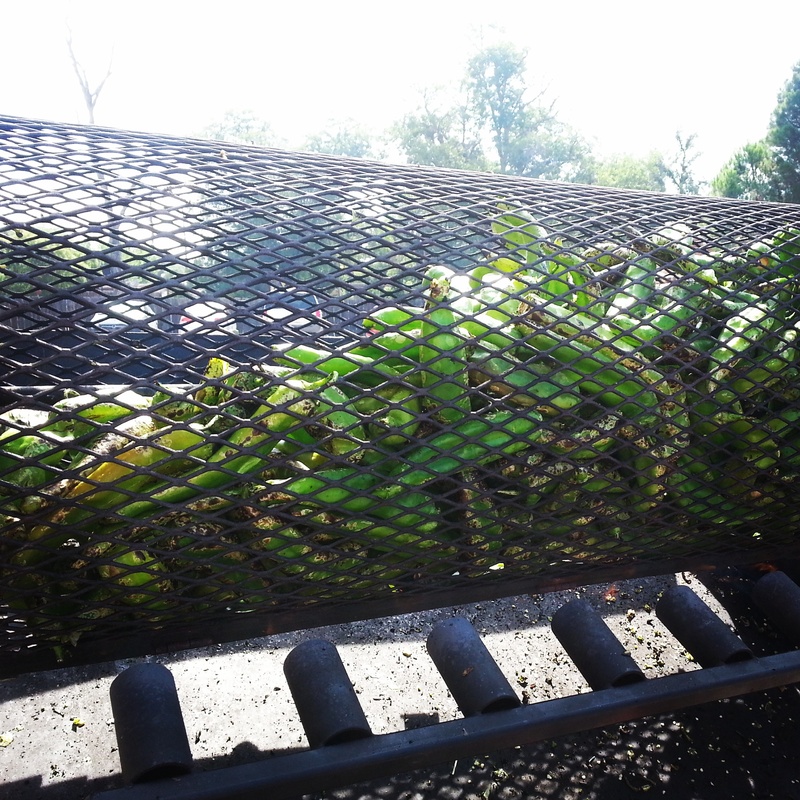 The chili’s are typically harvested in August/September, but being that the season started earlier this year we got to start the Hatch harvesting a few weeks early! 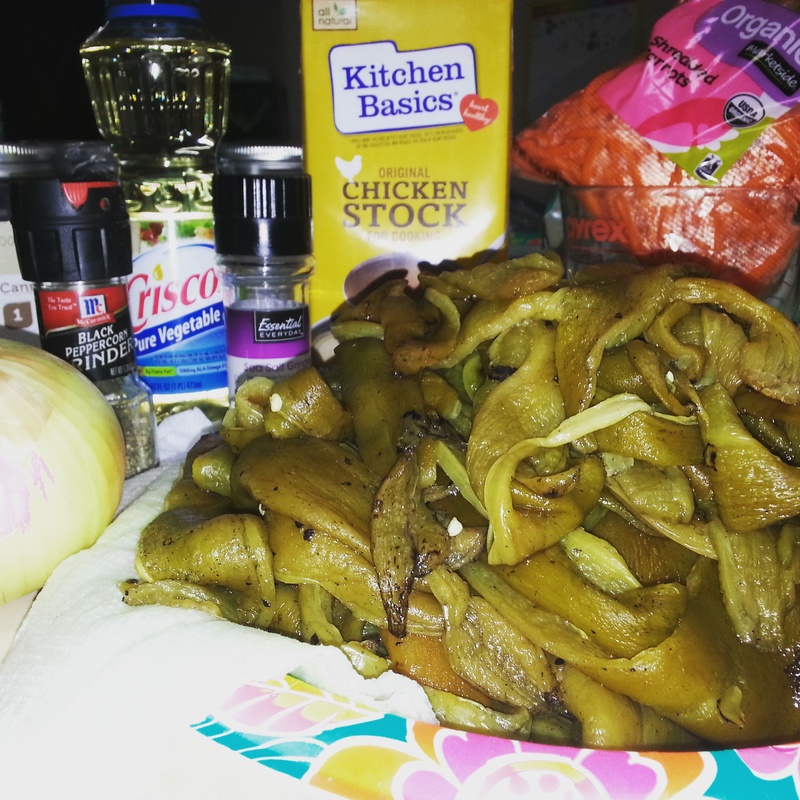 Their are even festivals dedicated to this spicy, delicious green chili! In fact, my town celebrates every weekend in August with a Hatch Green Chili Fest! We decided to attend today to get our brewing, freezing, and jarring started! Mm mm Yum! Can you taste the heat? I have 35.4 lbs of Hatch Green Chili’s, weighing more than my small child, sitting on my kitchen counter, freshly roasted, spilling spice into the air. They are steaming hot making my girls eyes water every time they enter into the kitchen! It is an overwhelmingly pleasant but strong scent! We opted to split our chili’s spice level between mild and hot! 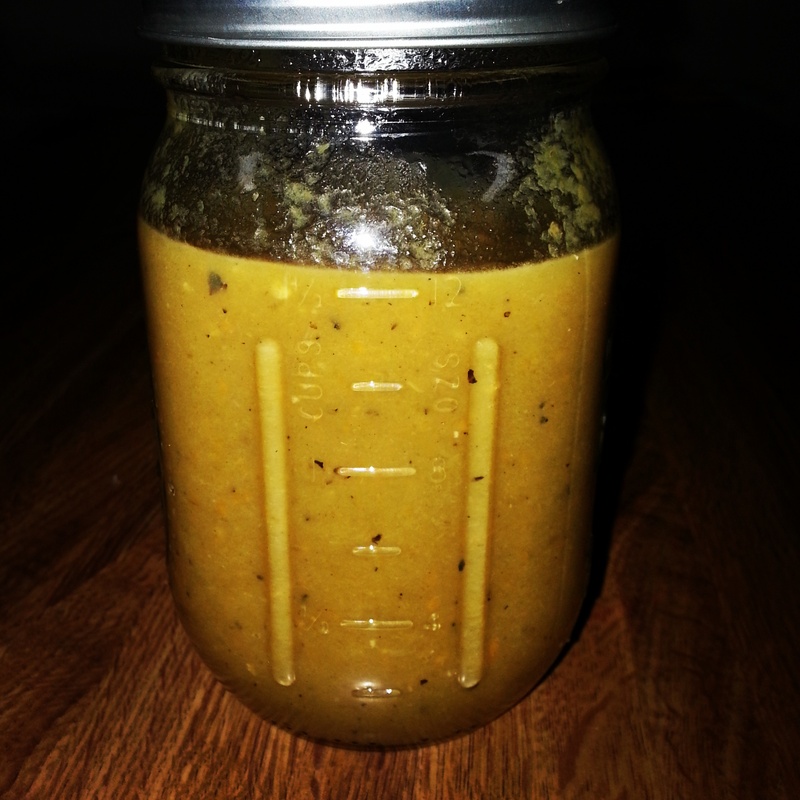 First let me share the recipe that I am using. I found it on Pinterest and I am only making a 10th of this recipe as a tester batch so that I can ensure that I have the flavor profile and texture I am looking for. This is a great starter recipe, but considering everyone has different tastes I recommend making it as is in a much smaller volume and seeing what you would like to change. 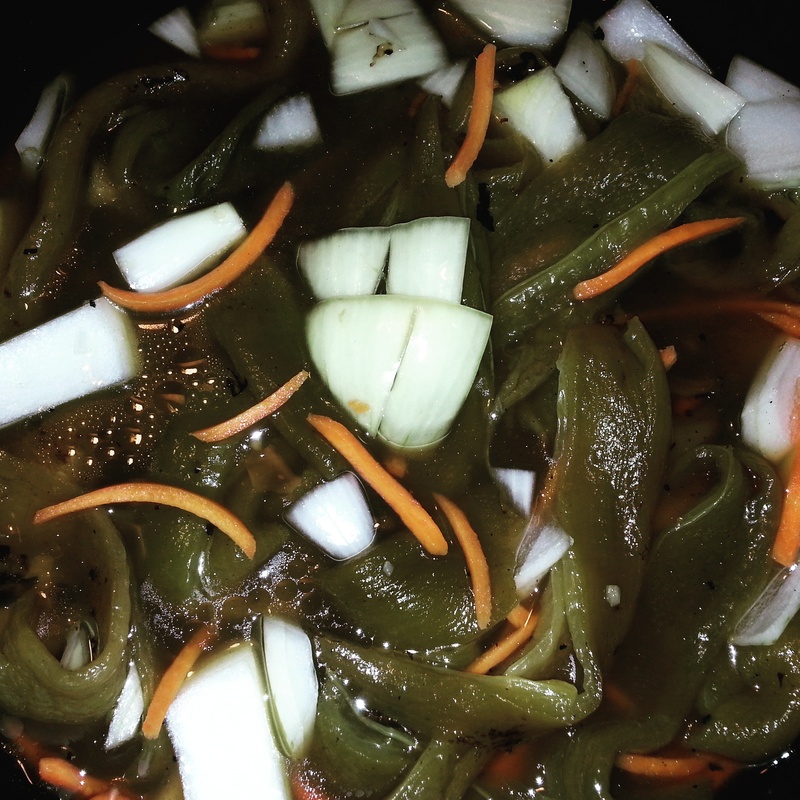 I am adding other ingredients to mine, since I am no stranger to green chili, but I’ll let you know at the end my changes. 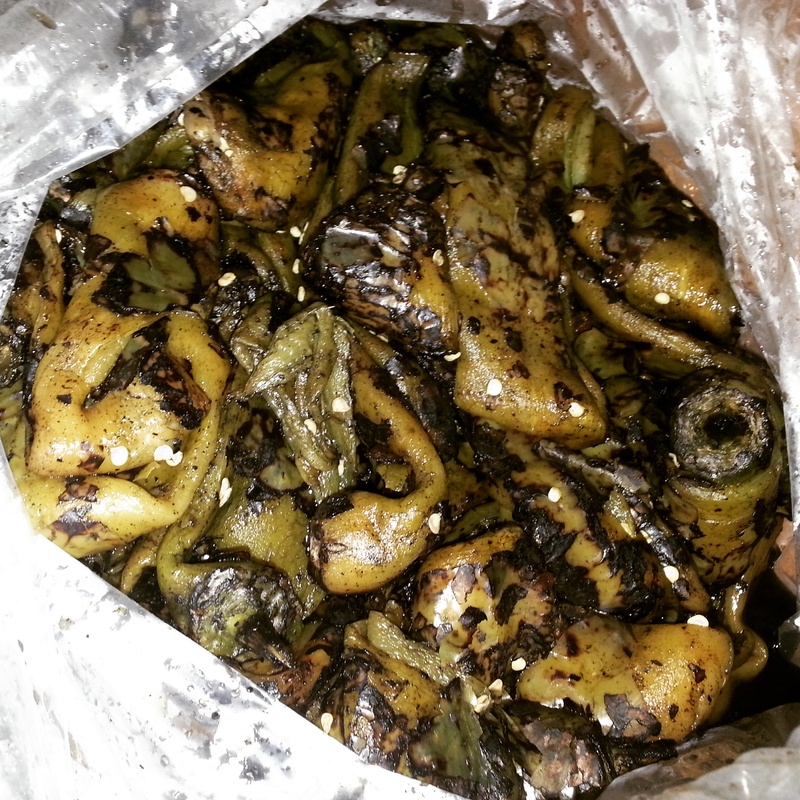 80 Hatch green chilies, roasted, peeled, and seeded. Before you can do anything with your chili’s they need to be cooled enough where the skin can easily be wiped away. Mine were packaged in a bag which allowed them to steam their skins off for about 3 hours. You can see below that the flesh of the chili’s are already shedding their skins and ready to be handled. Sure beats peeling them! When handling them I suggest pulling out a few pairs of disposable gloves. The spicy juices seep into your hands and nail beds allowing for you to unknowingly rub your eye leaving it burning for hours. The gloves help remind you that you are handling spicy food, plus it allows for a more sanitary cooking process especially if you are freezing or jarring and then sharing with family and friends. Once you are gloved up you can start peeling and seeding! I find it helpful to keep a bowl of water next to me so that I can rinse my gloves when the seeds and skins constantly get stuck to them! Throw it all in a stock pot, mix it and bring to a boil. Once boiling, cover and reduce the heat to low. Walk away and forget about it for 3 to 5 hours! This is when I put in a good couple hours peeling and seeding a good chunk of chili’s. All recipes need this to be done, so I like to go ahead and get them prepped while I am still excited about the newness of Hatch Chili’s in the house! They freeze very well making it easy prep new recipes over time. I checked in on mine after 4 hours, lifted the lid and sniffed in a delightful aroma! I pulled out my blender and using a slotted spoon removed the goods from the pot. I like my salsa a bit chunky so leaving the stock in the pot works better for that, plus you can always add liquid to get the desired texture you are looking for! I have my tester jar ready to be tried today by the spice expert – my husband! Once tasted and loved I will be a jarring maniac! As promised before I’ll tell you my add ins. I added some lime juice and cilantra to accent the Hatch, as well as some tomatillo’s to add a little more body to the flavor. Who wants some homemade salsa?